I have tried to follow a few tutorials for creating a lomo effect on photographs with Photoshop, but I have found all of them to be frustrating. 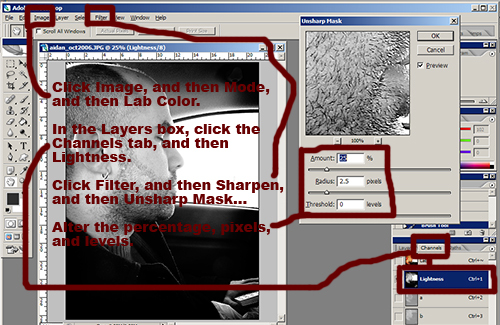 The person writing the tutorial usually knows Photoshop far more extensively than I do, and so their instructions are often vague and/or complete gibberish to a neophyte like myself. I find myself blinking at the computer screen while I repeat the instructions for a fourth attempt, wondering if it is I who am missing steps five through eight every time or if the person who wrote the instructions just assumed I would know how to manipulate thirteen layers without any guidance. You know, because the manipulation of layers is innate knowledge like breathing and chopsticks. So, I thought I would throw my hat into the ring and show you how I have wrangled the lomo effect beast into a passable set of instructions. Here goes. For the purpose of this tutorial, I have chosen a rather pastoral-looking* photograph of the Palinode. See below. Pick the Rectangular Marquee Tool from the left toolbar. Choose a number greater than zero for the Feather amount in the top toolbar. I usually pick a number between 80 and 90 pixels. The higher the number, the greater amount of fadeout from the edge of the marquee to the edge of the photograph, so choose a lower number for a more dramatic effect. 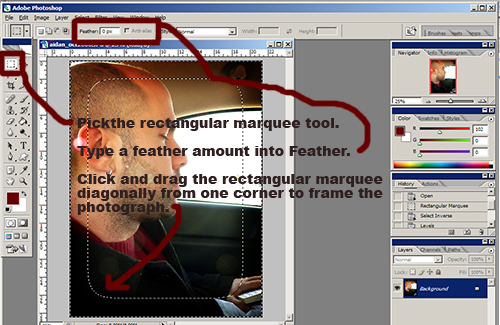 Click and drag the rectangular marquee diagonally from one corner to the other to frame the photograph. The feather effect renders the marquee with rounded corners. This will be the area that you will darken in the next step, so choose as narrow or wide an area as you want to be darkened. Click on Select in the top toolbar, and then click on Inverse in the drop-down menu. This switches your selected area of the photo from inside the marquee to outside the marquee so that you can darken the edges rather than the middle of your photo. Click on Image in the top toolbar. Click on Adjustments in the drop-down menu, and then click on Levels in the second drop-down menu. A pop-up box called Levels will appear. 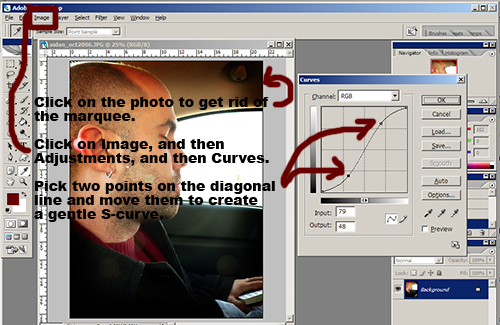 Drag the grey arrow under Input Levels to the right to darken the outer edge of your photo. I usually drag it until the center number above it changes from 1.00 to 0.50. Make sure that you still have the marquee tool selected, and click on your photo to remove the marquee you made previously. Click on Image in the top toolbar. Click on Adjustments in the drop-down menu, and then click on Curves in the second drop-down menu. A pop-up box called Curves will appear. Pick one point on the upper part of the diagonal line and drag it up or down and to the left, and pick one point on the lower part of the diagonal line and drag it up or down and to the right. This will create a gentle S-curve. Play around with it until your picture has the colour and contrast quality you want. Be careful not to go too dark, because you will be adding a darker layer in the next step. Click on Layer in the top toolbar. Click on New in the drop-down menu, and then click on Layer... in the second drop-down menu. 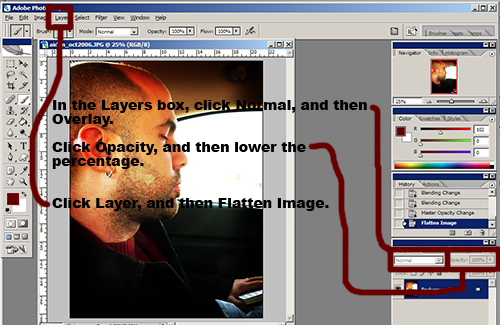 Another layer will appear in the Layers box to the right of your photo. Make sure that you have chosen the colour black. 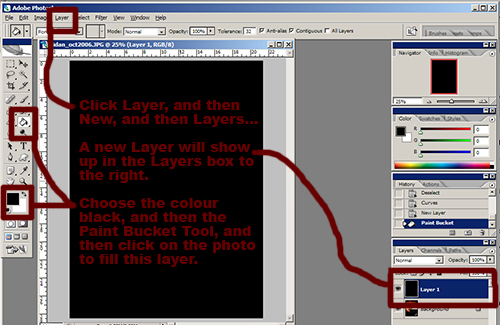 Choose the Paint Bucket Tool in the left toolbar, and click on the photo to completely fill this second layer. The whole photo will go black, but do not be alarmed. You will correct this in the next step. 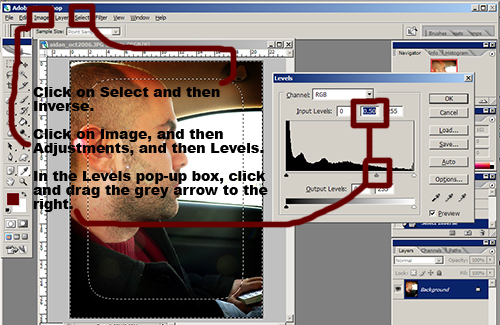 In the Layers box to the right of the photo, click on the drop-down menu arrow next to Normal, and then click on Overlay in the drop-down menu. Click on Opacity next to the drop-down menu and change the percentage until you receive your desired effect. I usually pick a percentage of 40 or lower, depending on the photograph. 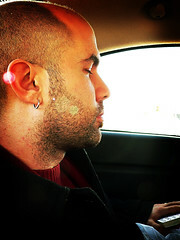 For this photo, I chose 20%, because I like a slightly more subtle effect. Click on Layer in the top toolbar, and then click on Flatten Image. Your two layers will now merge as one. Click on Image in the top toolbar. Click on Mode in the drop-down menu, and then click on Lab Color in the second drop-down menu. In the Layers box to the right of the photo, there are three tabs along the top. Click on the Channels tab, and then click on Lightness. This will make it look as though you have made your photo black and white, but do not worry. 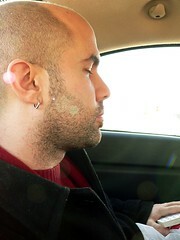 This is only momentary. A pop-up box called Unsharp Mask will appear. I usually set Amount between 25 and 50 percent, Radius between 2.5 and 5.0 pixels, and leave Threshold at 0 levels. 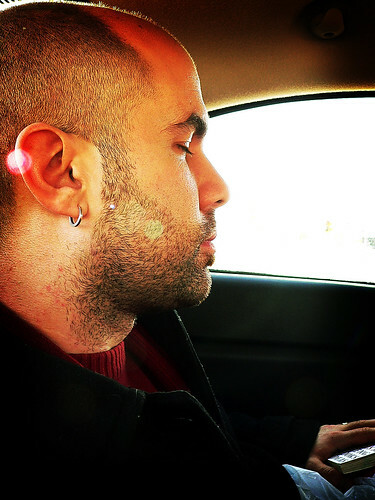 For this photo, I chose 25%, 2.5 pixels, and 0 levels. Click on Image in the top toolbar. Click on Mode in the drop-down menu, and then click on RGB Color in the second drop-down menu. I like this effect, because it can be used subtly to create a warming effect as in the photograph of the Palinode above on the right, or it can used more dramatically to create a much more vivid image that pops out in greater relief. If you have any questions, comments, or suggestions, you know what to do.